Lost tourist: How do you get to Carnegie Hall? Man on street: Practice. Practice. Practice. With practice and planning, we now have options in traveling from Midtown Manhattan to John F. Kennedy (JFK) Airport: personal car, taxi and the Long Island Rail Road (LIRR)/Air Train combination. Choosing car, cab or train depends on your schedule, number of travelers and budget. When we traveled between midtown and JFK in January, there were three of us and a large suitcase. Compared to the cost of three one-way tickets on the LIRR and Air Train, the taxi cost was reasonable, the service more convenient. Coming back, with two of us and no baggage, the Air Train was as convenient as the taxi and less costly. Personal Car: If you already have a car in the city, this can be a reasonable option. The costs include tolls if you use the Queens-Midtown or Brooklyn Battery Tunnel and, possibly, short-term parking. JFK has limited automobile access from the Van Wyck Expressway to the north and the Belt Parkway to the west and east. In rush hour, both roads clog up. Limited routes and rush hour traffic require planning enough time to get there. If you go to JFK for a passenger pick-up, you can park in short-term parking or use the recently opened “cell phone parking lot,” at the Federal Circle exit, near the airport entrance. When your traveler is ready for pick up, he or she calls from the curb and you then go get them. If you try this plan, take time before arriving at the airport to learn where the flight is arriving, there are many terminals, and where arriving flight pick-ups are. With two people available, one person can wait at the terminal for a welcome and helping out. The other drives back to the cell phone parking lot and waits for the call. Taxi: The fares are $45 now, plus tolls and tip, if any (no surcharges apply, and there is no luggage charge in NYC) for any trips to OR from JFK and anywhere in Manhattan, or $52 starting September 4, 2012. When we took the cab in January, it was clean; the driver was alert, careful fast. The big suitcase fit nicely in the trunk. The cab dropped us right at “departing flights” at our terminal. If you leave from a hotel, hotel staff may push you to use a car service instead of a taxi. Car services are not constrained by a flat fare and you could pay significantly more. ﻿ Air Train: This is a combination of LIRR and Port Authority rail service between Penn Station, at 33rd Street and 7th Avenue, and JFK. There is also a less expensive subway/Air Train connection, but it takes longer and may be more complicated for people new to the subway. 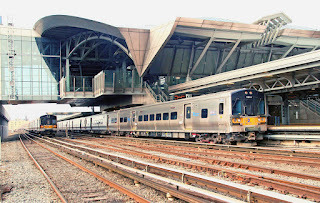 The Air Train is a set of computer-guided rail coaches that go between airport terminals, rental car offices and parking lots - - and the LIRR’s Jamaica station in Queens. On the trip where we took the taxi out to Kennedy, we returned via Air Train. The walk from the Jet Blue terminal to the Air Train station took five to 10 minutes. It was speeded along with moving sidewalks and was in a covered, climate-controlled walkway. 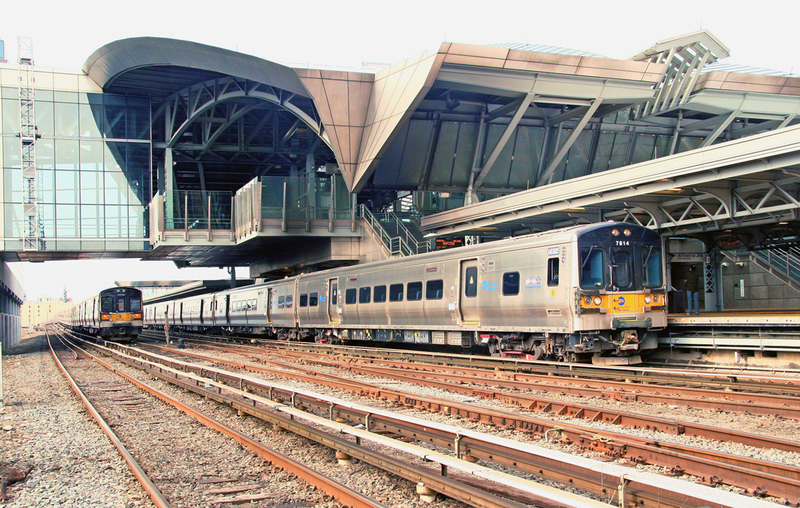 The Air Train and LIRR trains run relatively frequently. Both services are clean, well-lighted and felt safe at 9 PM on a Sunday evening. You pay the $5.00 Air Train fare when leaving the train at Jamaica or the stations in JFK. Staff will help with ticket machines; it is possible to buy an Air Train/LIRR pass, which saves a few dollars. Once you pay the fare, you walk one or two minutes and are in Jamaica station. The LIRR takes about 15 minutes to get to Penn Station from there. LIRR/Air Train pricing may be confusing. The price depends on whether you travel on a week day or the week-end - - or peak/off-peak. A one way Air Train/LIRR ticket ranges from $8.75 to over $13.00. The Port Authority website explains fares. The Long Island Railroad website also includes pricing information.